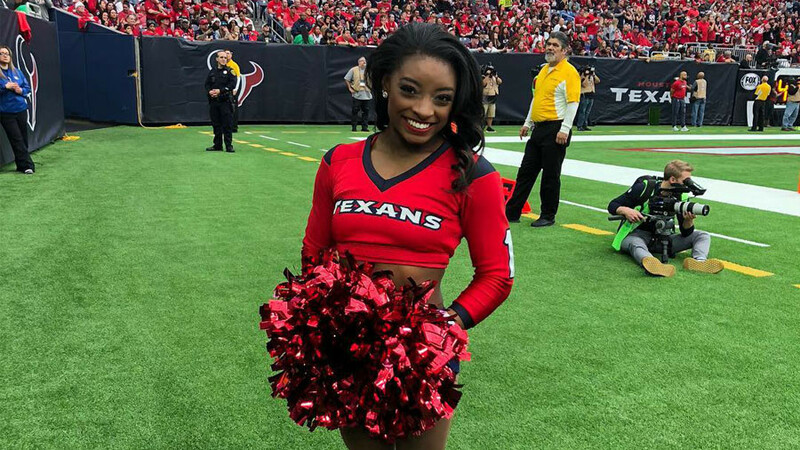 US Olympic champion gymnast Simone Biles has made her debut as a National Football League (NFL) cheerleader, turning out to cheer on her hometown team the Houston Texans during Sunday’s game against the San Francisco 49ers. Team USA’s most decorated gymnast was invited by the Texans to perform as the first-ever honorary member of the cheerleading squad after Biles expressed her wish to become an NFL cheerleader on her Twitter account. The 20-year-old Houston native was formally introduced to the squad on Friday, when her fellow cheerleaders gave her a pair of their famous red boots, which she donned for the occasion. Biles attended two practice sessions with the cheerleading team before showing off her skills on the field at NRG Stadium. She said that her fellow Texans cheerleaders had helped her get ready for her first appearance. “They've been so helpful in and out of practice, sending me videos and all that and even just today, they're like, 'Let's go over this,'” Biles said. "So, they're so helpful in telling me how the crowd's going to react and how loud it's going to be so to not pay attention because you can get distracted." The four-time Olympic gold medalist and multiple world champion said she enjoyed the experience of waving the red pom-poms on the sideline. “I had such an amazing experience cheering at the Texans Game. Definitely a memory to last forever!” Biles wrote on her Instagram page. I had such an amazing experience cheering at the Texans Game ❤️ Definitely a memory to last forever! The gymnast, who has recently resumed her full-time training after a year layoff, is eyeing a return to world-class competition next year. At the 2016 Olympic Games in Rio de Janeiro, the tumbling powerhouse, who has been unofficially crowned “the Michael Phelps of gymnastics”, completed her Olympic run with five medals.